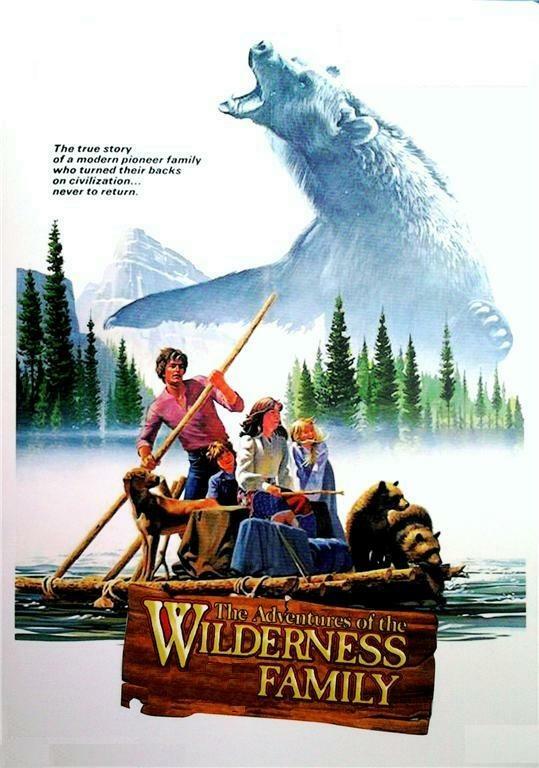 When I first caught up with it on pay cable as a kid in the 80’s, I was wild about The Adventures of the Wilderness Family and its sequels. I’d been hunting down a DVD in recent years but hadn’t managed to come across one (a special edition has been released but it’s not offered through Netflix yet). Yesterday, by pure chance, I came across an old discarded VHS copy at a rummage sale and as I quickly snatched up and pocketed my find, mused over the priceless treasures some people choose to toss out. At least until I got it home and popped it in an old VCR I keep oiled just for such an emergency. This is one of those instances when a cherished movie that impacted us greatly at an earlier stage of our movie going lives, doesn’t measure up to the memory. Art isn’t static. It changes and evolves along with the times, which is why critical reappraisal will always be necessary. One can watch a movie at a certain point in time that may connect with events then occurring in their own life and feel it speaks to them. When viewed again later, once we’ve passed through that phase or become more cinematically sophisticated, the exact same movie may affect us completely differently. The movie hasn’t changed, we have. Such is the case with The Wilderness Family, which I hadn’t seen in decades. Catching up with it again as an adult, it’s a film one must watch through the rose-colored prism of childhood nostalgia. Distributed by Pacific International Enterprises in 1975, and directed by Stewart Raffill, who also penned the screenplay, I was surprised by how little substance there is to the Arthur R. Dubs story he fleshed out. This contemporary reworking of Swiss Family Robinson has the modern Robinson family roughing it in the wilds by choice rather than happenstance, as unhappy, unfulfilled father Skip Robinson (Robert Logan) relocates wife Pat (Susan Damante Shaw), young son Toby (Ham Larsen) and asthmatic daughter Jenny (Hollye Holmes) from the smog clogged, overcrowded city to the clean mountain air of the Rockies. Their decision to tune in and drop out played into the popular counter-culture sentiments still prevalent in the seventies. He and his wife want to pursue the sort of reverie they dreamed about when they were still idealistic young hippies. By turning their back on civilized society in favor of a more rugged existence, they’re looking to find a less vacuous and artificial, more spiritually nourishing lifestyle. In premise, The Wilderness Family isn’t too far removed from Sean Penn’s more thought-provoking Into the Wild of recent years. Where these city dwellers manage to amass the knowledge and survival skills necessary to thrive in the harsh wilderness is treated as a moot point, but the movie’s conservationist sentiments sat well with seventies’ audiences, when the concept of wildlife and ecological preservation was making real inroads into mainstream consciousness. In addition, the grassroots appeal of getting back to nature, going native and living off the fat of the land always wields special appeal to audiences in socially tumultuous times. The concept serves as wish-fulfillment fantasy for adults, in the post-60’s the same way it had in the depths of the Depression, when movies of a similar bent, like Tarzan the Ape Man and Bird of Paradise, were so popular. The Adventures of the Wilderness Family plays on similar, if unspoken in this instance, notions concerning the inherent sinfulness of city life and the preferable purity of country living. The polluted city is literally suffocating the Robinson daughter, who needs the clean mountain air of God’s country to recuperate. The location cinematography by Gerard Alcan is beautiful, even on the faded VHS copy I viewed (which bore the shorter, U.K. release title The Wilderness Family), but the unnecessary images of the family scampering through the wilds and cavorting with the wildlife they’re now at one with in slow motion, all set to the enjoyably lachrymose title song performed by Lee Dresser, seems like seventies cinema at its cheesiest. The adults are competently dependable, but the mountain man character played by George “Buck” Flower should have been built up. His scene stealing introduction as Boomer suggests he’s meant to play a more integral part in proceedings than he actually does. The little boy playing Toby remains funny and refreshingly unaffected, his lack of professional polish suits the raw atmosphere of the rest of the production; as the daughter however, Hollye Holmes comes across as terribly artificial by contrast and she constantly seems to be being imperiled by the filmmakers, getting chased down by just about every critter in the cast at some point or other, which really tries one’s patience. Let’s be honest, the real stars here are the animal actors, but unfortunately the movie suffers terribly from its repetitive use of them to supplant the comedy and melodrama the human cast fails to supply. Once the Robinsons begin to settle in for their first year, every other scene presents an identical setup with one member of the family or another under attack by some form of wildlife, be it cougar, wolf or bear (Oh My!). Moreover, each scene ends the exact same way, with their miraculous rescue at the hands of either pet dog Crest, or tamed circus bear Samson, who arrive in the nick of time to save the day. Apart from the mother who, perhaps in a nod to the women’s movement, discovers a sense of her own self-sufficiency, protecting the brood and saving the day after her husband takes off down river to find a doctor for their ailing daughter (no longer helpless, she can now choose to stay rather than return to civilization as she’d formerly wanted to do), the writers have failed to establish each family member’s own resourcefulness and capabilities. At times they come across like dilettantes who have bitten off far more than they can chew; and what in the world are they going to do when their children reach the age where they need to interact with other kids to develop social skills? The movie isn’t interested in exploring this darker angle though, the pitched battle of man vs. ever encroaching nature or inferring that they might have been rash to chuck it all for this idealistic adventure. In essence, The Wilderness Family feels like a variation on those Walt Disney True-Life Adventures series, only with far scarier animal encounters, including that rather hair-raising final one, where the ramshackle cabin is besieged by a giant grizzly that busts out the windows and gnaws down the door as it slowly and inexorably claws its way inside. Scenes like these seem to have directly inspired the Jaws variation Grizzly, which would be released not long after. This entry was posted in Action/Adventure, Family and tagged 1970's, conservation, counter culture, Cult Movies, Disney, family films, Grizzly 1976 movie, hippies, Into the Wild 2008 movie, Jaws 1975 movie, nature films, Pacific International Enterprises, Robert Logan, Sean Penn, sequels, Stewart Raffill, Susan Damante, The Adventures of the Wilderness Family 1975 movie, wildlife films. Bookmark the permalink.